Enterprise law firms are pro-actively targeted by hackers due to the volume of sensitive personal data that they hold. 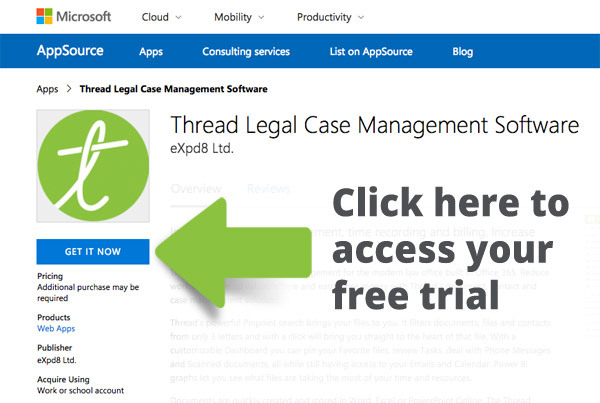 Thread Legal is built with Microsoft, and data is hosted in Microsoft Azure data centres. Microsoft has the most security certifications of any cloud provider, and are trusted by governments and multinational companies across the glode. Their SLAs promise at least 99.9% uptime, so you can be sure that you won’t lose access to your data due to upgrades or other maintenance. Microsoft allow you to dictate where you would like your data to be held, so that you can easily comply with GDPR requirements. With Thread Legal, your data remains your property both during and after your contract, and your IT department is responsible for its management. This means that your IT department always remains in control, and you can be sure that your data is as safe as your IT team can make it. Enterprise systems often become almost obsolete as soon as they are installed, and large amounts of money can be spent on upgrades. Thread Legal is built with Microsoft technology, meaning that whatever innovations Microsoft create, whether in the fields of AI, blockchain, bots or up-coming ideas, can be incorporated within Thread Legal. The software is updated every six weeks, so innovations can become a reality within Thread very quickly, and suggestions by clients are often implemented within a matter of weeks rather than months or years. As technology continues to evolve, Thread Legal has the capability to evolve with it and to incorporate the latest Microsoft technology to benefit the modern lawyer. Thread Legal encourages seamless collaboration between teams through a variety of tools that ensure that every member of the team knows exactly how far the case has progressed and what they personally need to do to bring it to completion. Thread Legal allows both large and small project teams to assign each other tasks, work together on documents in real time and see all emails relating to the case. This enables seamless business continuity – if someone is unexpectedly ill, or suddenly leaves the business, the person covering the case instantly has the full details of every interaction and document sent to the client, and can pick up where the absent individual left off. Thread Legal encourage seamless collaboration between teams through a variety of tools that ensure that every member of the team knows exactly how far the case has progressed and what they personally need to do to bring it to completion.